Join Raven and his guest Gayle Ross as she shares the tradition of storytelling with us all. Through her stories comes messages for the people about treating their environment and each other with respect, and love. 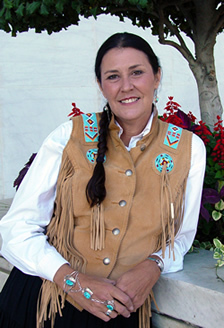 Gayle is a descendent of John Ross, principal chief of the Cherokee Nation during and after the infamous “Trail of Tears,” the forced removal of many Southeastern Indians to Indian Territory (present-day Oklahoma) in the late 1830s. Her grandmother told stories and it is from this rich heritage that Gayle’s storytelling springs. During the past twenty years, she has become one of the most respected storytellers to emerge from the current surge of interest in this timeless art form. Gerald Barnes was born in Pleasant Point, Perry, Maine and now lives in Virginia. As a child he learned traditional Passamaquoddy basket weaving from his mother and father. To make his work unique, he developed the turtle as his personal symbol. For Barnes the turtle represents longevity and sustenance but, more importantly, these slightly imperfect turtles represent the adverse effects of pollution on the environment. How Rabbit Tricked Otter and other Cherokee Trickster Stories. How the Turtle’s Back Was Cracked: A Traditional Cherokee Tale. New York: Dial Books for Young Readers, 1995. The Legend of Windigo: A Tale from Native North America. Bruchac, Joseph. The Girl Who Married the Moon. Mahwah, N.J.: Troll Communications, 1994. The Story of the Milky Way: A Cherokee Tale. Established in 1989 through an Act of Congress, the National Museum of the American Indian is an institution of living cultures dedicated to the life, languages, literature, history, and arts of the Native peoples of the Western Hemisphere. The museum includes the George Gustav Heye Center, a permanent exhibition and education facility in New York City, and the Cultural Resources Center, a research and collection facility in Suitland, Maryland. A new museum on the National Mall in Washington, D.C., is now under construction and will open in September 2004. For additional information on the National Museum of the American Indian visit the museum’s Website at www.AmericanIndian.si.edu. This entry was posted in Make No Bones Shows and tagged An Evening with Native American Storyteller Gayle Ross, Cherokee, Chief John Ross, Honoring, KAOS 89.3 FM, Native American Indian, Native Storyteller, Native Woman, Raven Redbone, Voices of Native America. Bookmark the permalink.